This function results in text forms that can vary between light and bold (like a multiple-master font), but that can also go over the edges, and calculate extreme bold or extreme light fonts. 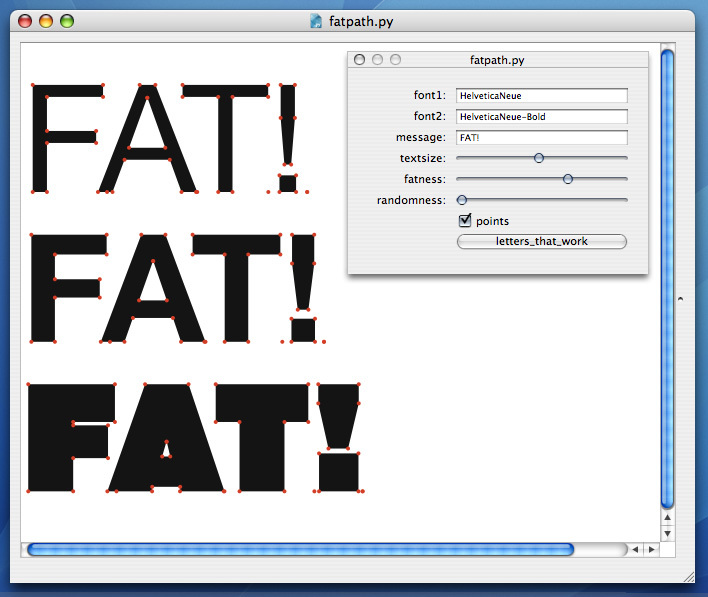 Fatpath is rather dumb: paths have to match exactly, point-for-point, or the algorithm doesn't work. This means (in general) that you can only use fonts of the same family, and even then, there is no guarantee that letters match. Letters with curves are especially troublesome. A special button, lettersthatwork, shows which letters you can use for the given fonts. Last updated for NodeBox 1.0rc7.